T.B Joshua has been forced to release a statement after Kenyan media reported that police were investigating whether the earlier reported murder-suicide was connected to his Church. It was alleged that the man's family had said that belonging to a religious cult led to their brother mutilating his wife and probably also killing all his children. One child's body has been found while two boys remain missing. [Read here]. Magu's mother Kezziah Wambui said she believes the deaths were as a result of religion and spirituality. She said her efforts to convince Magu to ditch the church fell on deaf ears. She said her son had accumulated a lot of wealth while working as a lawyer but had disposed of a lot of his property to fund the 'work of God'. Ms Wambui said her late son shocked the family when he said he was leaving his well-paying job to concentrate on serving God, Standard reports. She said since he resigned from his job and joined the church, her son changed and became withdrawn. She however added that Magu and his wife always seemed very happy together, adding that no any family member suspected things would end up the way they did. "My son suddenly became reserved and even stopped coming home to check on us. He became very religious and seemed to live his own life and did not want family members to intrude. There were no signs of marital problems. What has happened has shocked us as a family." Different versions of the story have also proliferated across Kenyan social media with some reporting that neighbors claimed the deaths were part of a ritualistic sacrifice for a church he apparently served. According to Standard Media, lawyer Paul Magu and his wife Lydia Wangui were staunch followers of TB Joshua's Synagogue Church of All Nations (SCOAN). Magu's passport showed he had travelled to Nigeria more than 20 times since 2009 to attend the church services. 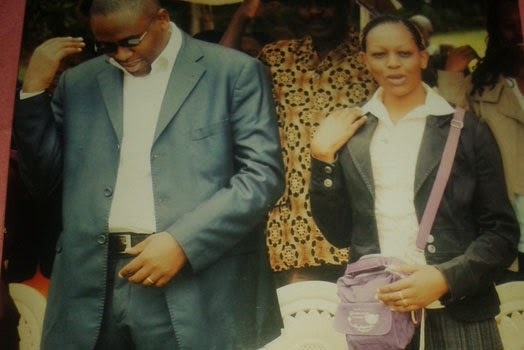 Police are also said to have discovered literature and audiovisual content of a Nigerian pastor, at the couple's home. This is an official statement from Prophet T.B. Joshua. My attention has been drawn to several publications in Kenyan media alleging that Mr Paul Magu had visited The Synagogue, Church Of All Nations (SCOAN) in Lagos, Nigeria over 20 times. These reports are both untrue and ridiculous. It must take a religious spirit to believe and say this! Thousands of people come here with their problems from around the world. This may be one of the people that came with depression and a spirit of suicide for deliverance. If he was delivered here, perhaps he lost his deliverance. He may have gone back to his past life. Because you come here for prayer does not mean you are a friend of Jesus. It is only when you maintain your relationship with Him – that makes you a friend. You religious people – stop blaspheming. We are Christians; we are not exchanging issues with you. We pray all spirits of religion in your life be delivered, be removed, in Jesus’ name! In John 10:10, the Bible says that satan came to steal, kill and destroy but Jesus came to give life and life in abundance. That is our mission – to give life in abundance, in Jesus’ name. Kenyans, remember that this is not the first time false rumours have been spread concerning me in your nation. Several rumours were spread online previously that I had prophesied Al-Shabaab terrorists would kidnap and kill Kenya’s President. Why this hatred for me in Kenya? This is a religious spirit. Take note – one may claim to be a Christian yet be religious. People with a religious spirit have no independent mind – they take everything they hear, see and read without finding out the truth. We are all brought up from a religious background and delivered to become Christians. Yet many claim to be Christians who are still not properly delivered. Therefore, we should examine everything in the light of God’s Word. This is what the Bible means by find out the truth and the truth shall set you free (John 8:32). I want to believe the religious people are behind this story. I have never been to Kenya before. This will not stop me from one day coming to Kenya – at God’s appointed time. What does he mean by 'religious' thou? Like its a derogatory word? Every Paragraph blames 'religious people' can he please give a statement without speculations and imaginary enemies? He is soooooo shady!! !